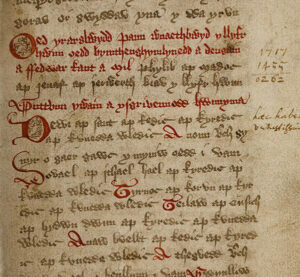 ‘The Cult of Saints in Wales’ research project at the University of Wales Centre for Advanced Welsh and Celtic Studies, Aberystwyth, has been engaged in the editing and translating of medieval Welsh saints’ Lives, poetry addressed to the saints, and saintly genealogies. As this project draws to a close, an exhibition of medieval and early modern manuscripts that are the source of this literature will be displayed at the National Library of Wales, Aberystwyth, from 18 February – 10 June 2017. 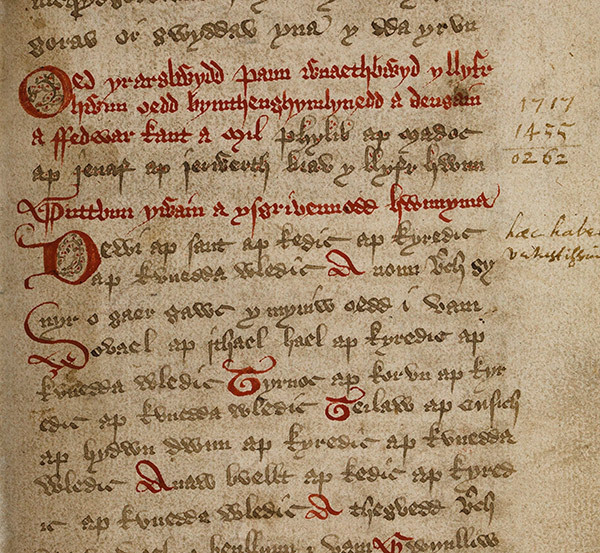 Included in the exhibition are some important medieval Welsh manuscripts, such as the Hendregadredd, the Book of Llandaff, and the Llanbeblig Hours, alongside some early modern recusant manuscripts containing late medieval saints’ lives and poetry. The fruits of the project are being published online, and will be launched at a one-day conference at the National Library of Wales planned for 3rd June. There will also be talks relevant to the project at the Library by David Parsons (1 March) and Martin Crampin (17 May), and gallery talks on the 29 March. For more information about the exhibition see the summary.